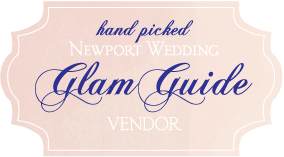 The Newport Wedding Glam Guide is an essential component of the site. It is a handpicked vendor guide for those vendors targeting couples getting married in the Newport, Rhode Island and New England area. This exclusive guide of wedding industry professionals includes an application and review process and is limited to a select number of vendors per category type. This provides an opportunity for the finest to really shine. Profile pages on the Newport Wedding Glam site will include one photo with a 50-word detailed description, phone number, email address as well as links to websites or blogs, making them easily accessible and connected to brides. Our special vendors and advertisers are provided with a way to “Connect” with our readers. NWGlam “Connect” is an exciting feature on the site where brides and grooms “Connect” with the Glam Guide vendors and advertisers. Interested in becoming a Glam Guide Vendor? We can’t wait to hear from you and receive your application! You will receive feedback from us within two weeks of your application submission.